SNEAK A PEAK INTO THE BOOK! Purchase of the book includes access to valuable online resources, including a list of recommended music for circles, audio meditations with Jalaja, and much more! The Magic of Circlework is a brilliant, groundbreaking book and a must-read for any woman who recognizes the power of sisterhood. Graceful, clear and engaging, it conveys the healing power of women’s circles as no other book has done. At a time when women everywhere are standing up and speaking out, these profound teachings provide invaluable inspiration and guidance. 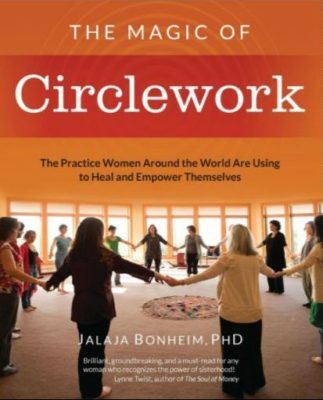 Jalaja Bonheim’s The Magic of Circlework offers humanity an essential relational structure and a powerful natural process for establishing the deep connections we human beings need in these challenging times. A beautiful and uplifting awareness of what truly matters unfolds effortlessly through its clear, and engaging language. Powerful, profound, and transformative reading!